Brown ground beef in medium nonstick skillet over medium-high heat until thoroughly cooked, stirring frequently. Drain. Add frozen rice mixture and pepper. Reduce heat to medium-low; cover and cook 8 to 10 minutes or until rice and vegetables are tender, stirring occasionally to break apart rice and vegetables. Spoon about 1 cup mixture down center of each warm tortilla. Top with cheese. Fold up bottom of each tortilla; fold in sides. 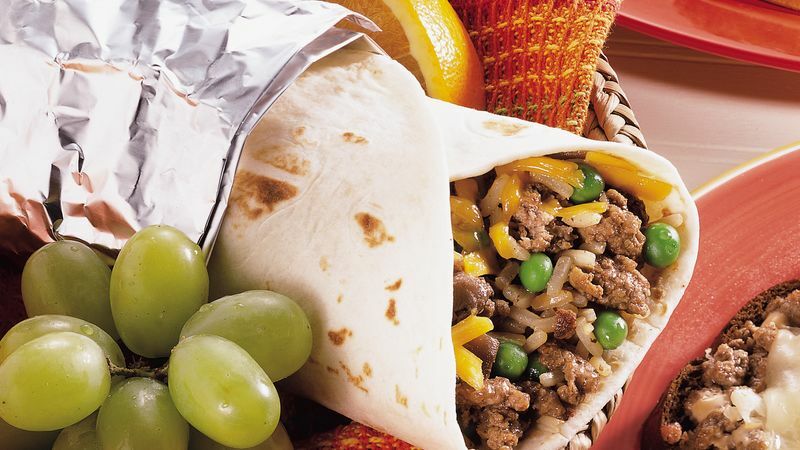 If desired, enclose bottoms of wraps in foil.